There are a few different types of fleas; dog, cat and human. Fleas live externally on the skin. They have mouthparts adapted for piercing skin, sucking and surviving off the blood of mammals and birds. For every one flea found there are hundreds of eggs, larvae and pupae in the environment. It is essential the surrounding environment the pet has access too (don’t forget your car) is treated along with the animal in question. These are usually visible to see along with the flea which look like black dirt within the coat by stroking the coat in the opposite direction. It is always best to seek the advice of a veterinarian as high infestations can cause anaemia. 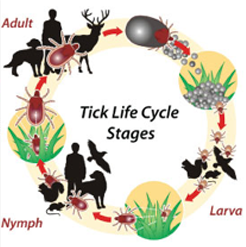 The Tick, a common parasite lifecycle that can take up residence in your pet and home. There are two different types of tick in the UK; soft and hard tick. The most common is the hard tick. Ticks live externally on the skin. They have mouthparts adapted for piercing skin and sucking the blood of mammals, birds, sometimes reptiles, burrowing their heads inside and sucking until engorged (full). Ticks can carry and transmit a number of diseases most commonly; Lyme disease. Also, transmittable; Rocky mountain spotted fever, Tularemia, Ehrlichiosis, Relapsing fever, Colorado fever and Babesiosis. It is important when removing a tick that the whole of the body is intact and the head is not left inside the host as this can cause infection and may need further veterinary treatment. Ticks feel and look like a small lump on the dog’s skin. Please take care to make sure you are not mistaking a ‘wart’ or ‘skin tag’ for a tick. 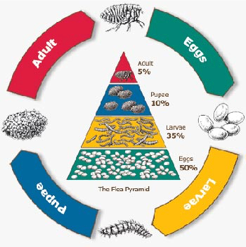 The Mite, a common parasite lifecycle that can take up residence in your pet and home. 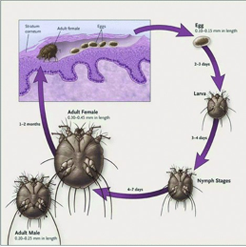 There are a few different types of mite; Ear mites, surface mites and mange mites (Demodex and Sarcoptic). Ear mites are contagious to other animals if they come into close contact. They live inside the ear canal producing a dark waxy discharge. They are extremely irritating and can cause the animal to scratch and shake its head. Walking mites are light in colour and large enough to see moving around. Harvest mites are tiny orange mites. Common hiding places are often between the toes, on the legs and stomach. contagious. They can cause skin problems if the animal is already suffering from malnutrition and stress. Sarcoptic mange (refer to diagram) is highly contagious and intensely itchy. They can cause permanent damage to the skin because the animal will scratch and bite so intensely. These mites breed incredibly quickly. Immediate consultation of a vet. All articles are for educational purposes only and in no circumstances, diagnose your pets condition. If you are concerned for your pet`s health always seek advice of your Veterinarian. Click here to see more potential threats to your pet.